My oldest girl and I love books. It’s like our love language, really. Multiple people gifted her books for her birthday last week and we both almost always have a book with us. She’s been into discovering new books lately, so we were all about the opportunity to review “The League and the Lantern” by Brian Wells. Well, she’s going to review it, and I’m going to share some other points with you. “The League and the Lantern” is a very good adventure story. I like that Jake has a lot of questions and he’s looking for the answers. He likes adventuring and has good friends. Lucy know how to fight really well. She’s my favorite character because she likes things to be causal when people question why these seventh-graders are alone with no supervision. T.J. always makes up weird stories when police officers or adults are nearby ask why they’re alone. There is a bunch of bad guys, police officers, and suspicious people – some who are Jake’s best friends. Jake’s Uncle Gabe even goes missing and they try to track him down. While they try to track him down, they make other exciting discoveries. 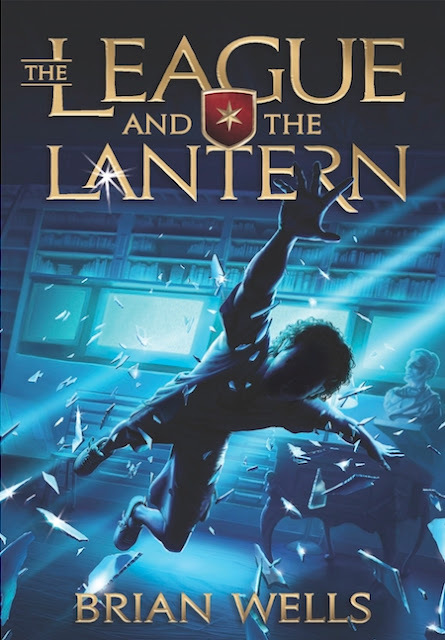 FROM THE PARENT :: “The League and the Lantern” helps inspire reading because it’s the beginning of an adventure series your kids will want to read. Plus, there’s educational value with the 140 key vocabulary words hidden throughout the story and historic sites that are part of the setting. Lessons in family, friendship, mercy and compassion are ones parents long for their kids to learn. And those lessons go beyond the pages with the buy-one-give-one campaign to get books into the hands of kids who cannot afford their own copies. ABOUT THE BOOK :: “The League and the Lantern” is the first book in a new adventure series for middle-school readers. It all starts when a dangerous organization invades Jake Herndon’s seventh-grade sleepover. He escapes along with two new classmates, Lucy and TJ, only to face a 48-hour fight for survival on the streets of Chicago. The kids unravel a mystery dating back to the Civil War, and an incredible secret about Jake’s family. Along the way they learn unexpected lessons about courage, family and friendship. “The League and the Lantern” became a reality through a Kickstarter campaign. It is a 282-page hardcover book aimed at readers 9 to 14 years old published by Republic Ink (May 16, 2016). Learn more at the book’s official website or its Facebook page. ABOUT THE AUTHOR :: Brian Wells is a concerned dad who couldn’t find quality entertainment for his kids. He has worked and produced 15 TV movies for the major networks, and this is his book debut. GIVEAWAY :: And one of you can win a copy of this book! Use the Rafflecopter below for multiple ways to enter this giveaway, which is open through next Thursday, May 19 to U.S. and Canadian residents. Thanks to FlyBy Promotions/Propeller Consulting for the copy of this book that Cate reviewed and the copy one of you will receive in exchange for this post. The opinions here are mine (and Cate’s!). If you have won a prize from FlyBy/Propeller in the last 30 days or have won the same book from another blog, you are not eligible to win.